Sure, the big custom exhibits get all the glory, but in a lot of programs it’s the little ones that do the heavy lifting. So, we like to feature interesting examples of these too. 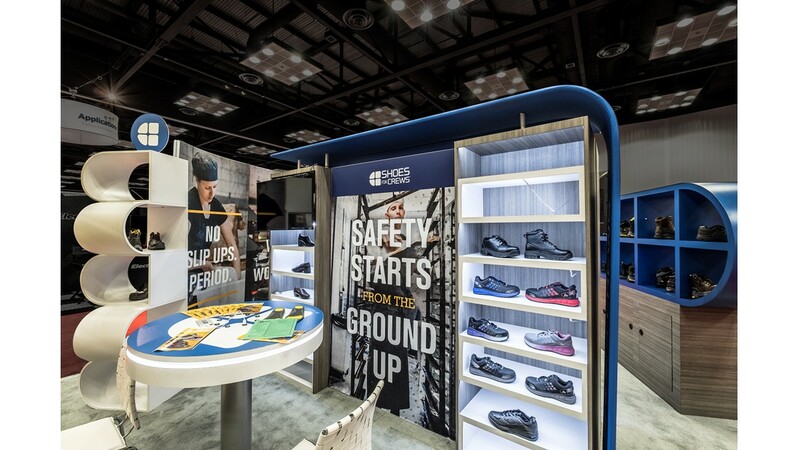 Like this one for Shoes for Crews – a company that makes specialty safety shoes for workers in restaurants, factories, hospitality, schools and more. Their claim to fame is their advanced slip resistant outsoles. Investing in a new exhibit is a big moment for any company. It’s also a unique opportunity to bring a tradeshow program in-step (pun intended) with the latest in design, fabrication and program management solutions. 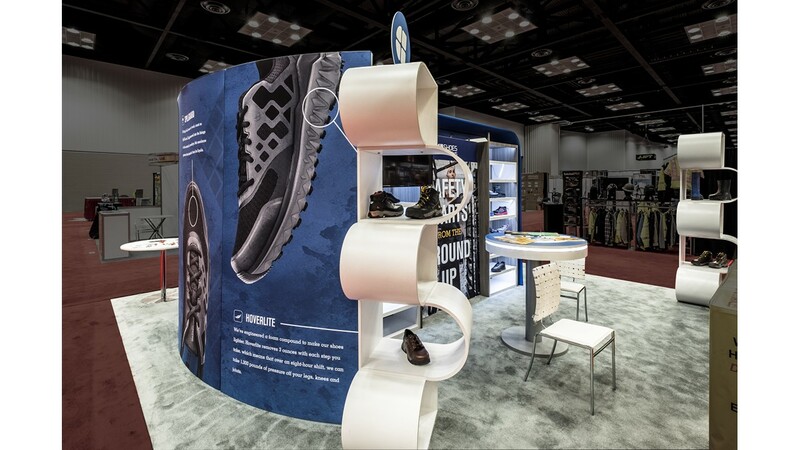 So when Shoes for Crews wanted a new modular exhibit that adapted to several different configurations for their 70+ show program, we were careful to ensure it would give them a edge on the show floor for years to come. We started by designing it as a system exhibit, working collaboratively with Classic Exhibits to capitalize on their system expertise. 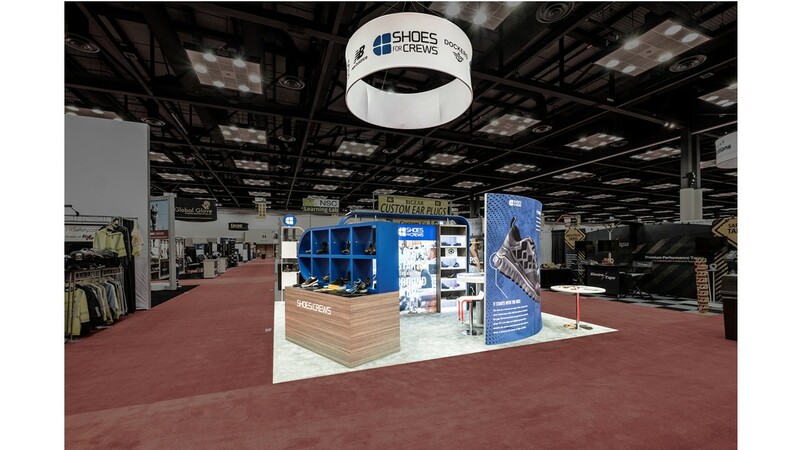 The exhibit incorporates Shoes for Crews new branding, and has the capacity to showcase a lot of different shoes in non-traditional and eye-catching ways. Inside, the booth is designed to give off a “work crew, break room vibe”, something that resonates with its intended audiences. 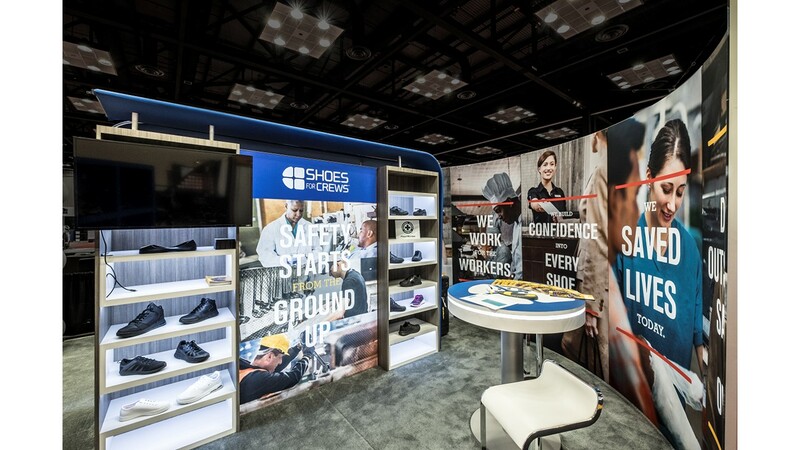 Just as important as what a visitor experiences inside the booth, is what the Shoes for Crews event team experiences managing it across its intended lifespan. With that in mind, the booth is designed to be easy and low cost to own and manage, minimizing freight and I & D time and costs across its busy schedule. Program management is further supported by Presto,™ Art Guild’s on-line show and real-time inventory management system – which makes it easy for Shoes for Crews to set up individual shows and see the latest up-to-date program information from anywhere. This exhibit has just been entered in Exhibitor’s Annual Exhibit Design Awards Contest. We’ll let you know what happens.